The Multiple Sclerosis (MS) Society sometimes invites people with MS to take part in their surveys, to help them shape their research and policies. If you’re living with MS and usually DON’T fill out their surveys they want to find out why and how they can better engage with you. Do you or someone you know have a diagnosis of MS? Do you live in Rotherham? 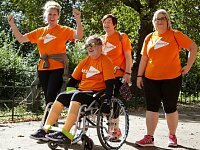 Would you like to be part of a FREE 12 week MS specialist exercise pilot project in April 2018?